“I had an urge to weigh myself this morning. I haven’t known my weight since I came out of treatment. It has been a huge part of my toolkit to let go of my weight. It’s never helped and I only obsessed about the numbers. They were never low enough or satisfactory to my ED. This morning though I was curious…well my ED was. 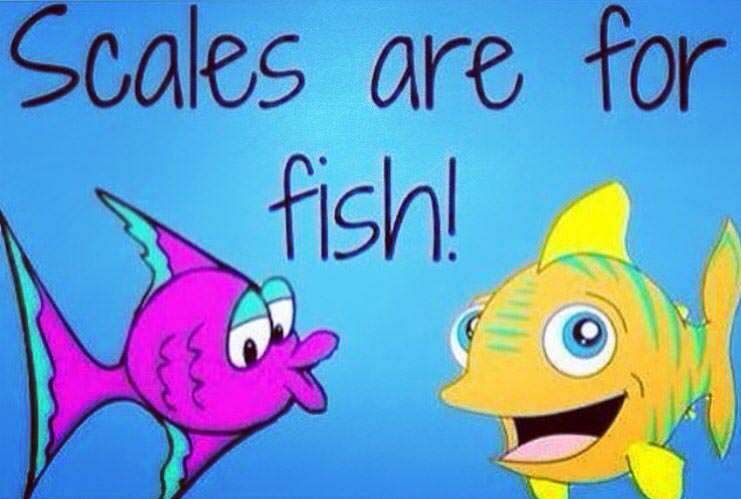 I don’t actually own a pair of scales and I sat down this morning and reminded myself of why. I’m not a better or worse person because of a number. I’m not more or less in control of my life because of a number. I’m not a nicer person to be around because of a number. My body is not more or less attractive because of a number. My mind and soul are not more interesting because of a number. I couldn’t think of a single reason why it would be of benefit to my healthy self to know my weight. It was only my ED wanting to sneak in again…so I simply told it to F*** Off and reminded myself that ‘Scales are for Fish’…oh and for making yummy cakes!